I’ve been intrigued with Brooks Wheelan ever since I saw him on SNL. Sure, the show didn’t give him much to do, but his desk pieces on Weekend Update were definite standouts and I still play them from time to time. Having noticed (and liked him) from the show, it only made sense that I would check out his debut album This is Cool, Right? Then it hit me: Wheelan’s standup is most definitely my cup of tea, and there was no way his sense of humor would be appreciated on a show like SNL. Having seen his standup a few times, I can honestly say that the man knows how to put on a show, that he’s funny, and that he’s talented. Let me tell you just how talented he is. Wheelan was playing a headlining weekend here at the Laugh Boston: a venue I had never heard been to but always wanted to visit. Once I arrived, It dawned on me why comedy acts I like don’t play this venue: it’s in South Boston, it’s attached to a Marriot, and has the vibe of a place where you get two-for-one coupons on Groupon. In other words, it’s where people go to see “comedy.” Last time I saw Wheelan was at the Middle East: a venue in Cambridge that probably caters more to his kind of comedy. Then, at the start of the show, the announcer choked, couldn’t remember Wheelan’s name, and introduced the host instead. The host then proceeded to make everyone uncomfortable by doing crowd work appealing to the lowest common denominator (with jokes about white people never having seen black people, that black people are criminals, and that people’s dates were too attractive for them). After this disaster, the second comic did a lot better with the room, focusing on his jokes instead of putting the audience on the spot. Then, the host came out and proceeded to do more of his crowd work, where, at least for me, I was doing my best not to get noticed and get bullied. How was the headliner supposed to excel in this environment? Well, then Wheelan came out next… and…he…KILLED. I’ve always thought Wheelan was a funny guy but after seeing him at Laugh Boston I am absolutely astounded by his talent. A crowd like this has to be won over and that he most certainly did and they trusted him almost immediately when he broke the ice about the announcer. He repeated some bits I heard last time he was in town, but most of his set was all new stuff, focusing on personal anecdotes interpreted from his particular point of view. Wheelan also riffed with some audience members and closed with a post-game press conference bit. I didn’t think I could say this, but as funny as This is Cool, Right? 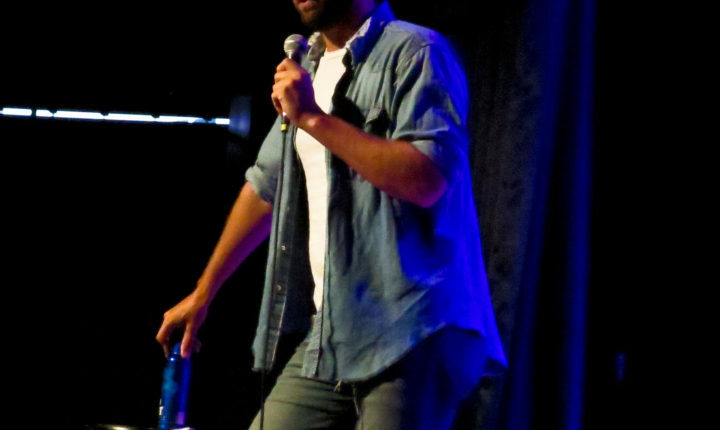 was, Wheelan’s comedy has developed spectacularly and he’s becoming a unique voice in standup. And, that brings joy to me heart and a tear to my eye. Catch the man in tour, you dummy.